Pulls like a champ, wet or dry. My truck has never let me down. I have thrown her in ditches and mud up to her windows, and she pulled out like a champ. I have hauled trailers, rvs, and convex boxes with her, and she pulls with ease. I put a power over drive brake system in her for these occasions. Everything else is stock, from the motor and transmission all the way to the exhaust. I have owned her since 2014, and I have replaced the tires and the brakes twice, along with other preventative maintenance. All in all, she's a great truck, and I'll be broken hearted if I ever have to get another. I love my truck. The most interesting thing on my truck is the different colored hood. My car is in an alright condition! I recently just busted the windshield so that adds to the look! I like the features such as the radio and the air conditioning, those are the two things that have stuck with me for the long haul! The performance of my vehicle is also great, as I keep up on changing my oil, changing brake pads, etc. 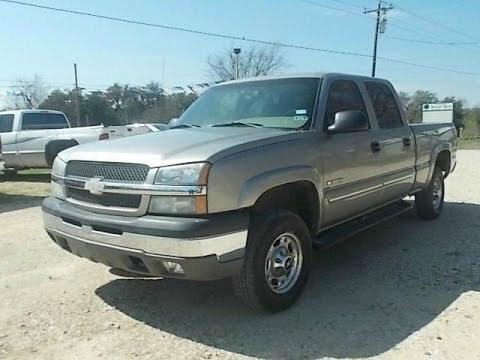 2003 Chevrolet Silverado diesel engine. The vehicle I drive the most is a 2003 Silverado with a Duramax engine. Never had any major issues, tows a 28 ft travel trailer with ease. Very slight change in accelerating when in tow package almost unnoticeable. Never had any major issues, kept up on scheduled maintenance.